Medu vada is one of the most popular South Indian breakfast dishes and it has besotted vegetarians and non-vegetarians alike. The dish is now popular around the country and is especially popular in Mumbai. The crispy, fried, savoury doughnut-like rounds of medu vada are served with piping hot sambhar curry, chilled coconut chutney as well as garlic chutney as accompaniments. Although the dish is a popular breakfast dish, medu vada can also be enjoyed during tea time, with a cup of steaming hot masala chai. The fried food is a blessing for those who crave something crispy and crunchy for the first meal of their day. There are a number of restaurants and eating joints that serve this irresistibly delicious treat, you can prepare it at home very easily as well. 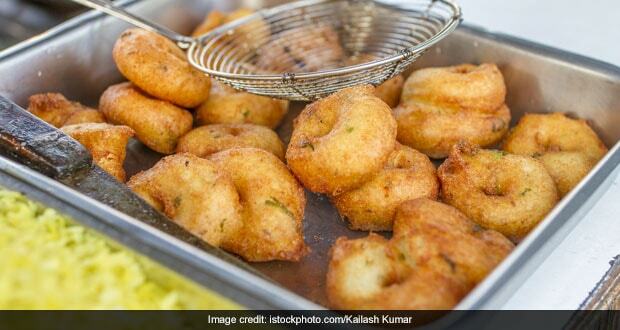 'Medu' is the Kannada word for soft and 'vada' means fritter or fried snack. It is also known as medu vadai, ulundu vadai, garelu etc. Whether you like your medu vada accompanied by fresh sambhar or you like to just gobble the dish as a fried snack, the taste is addictive. Medu vada is prepared by soaking black gram or urad dal and then grinding it with a number of masalas or spices (both dried and ground as well as fresh), fashioning the paste into perfect doughnut-like rounds and then deep-frying them. Curry leaves are also added to the batter, before the rounds are deep-fried to get a crisp and golden texture. What makes the medu vada a hot favourite among Indians is the sheer joy of breaking the crispy, fried round and dipping it in hot curry or chilled chutney and enjoying the burst of flavours in your mouth. Although the dish hails from Karnataka, it has spread roots in Maharashtra as well, where it is said to have been introduced by Udupi restaurants. Mumbai-based home chef and YouTuber Vaishali Polke teaches us how to make the sensational South Indian breakfast medu vada at home in her recipe video below.